Furthermore, abrupt glacier melt periods during Holocene warming events (as well as rapid glacier advances during Holocene cooling events) that easily exceed modern glacier morphology occurred in this region without any significant changes in CO2 concentrations. 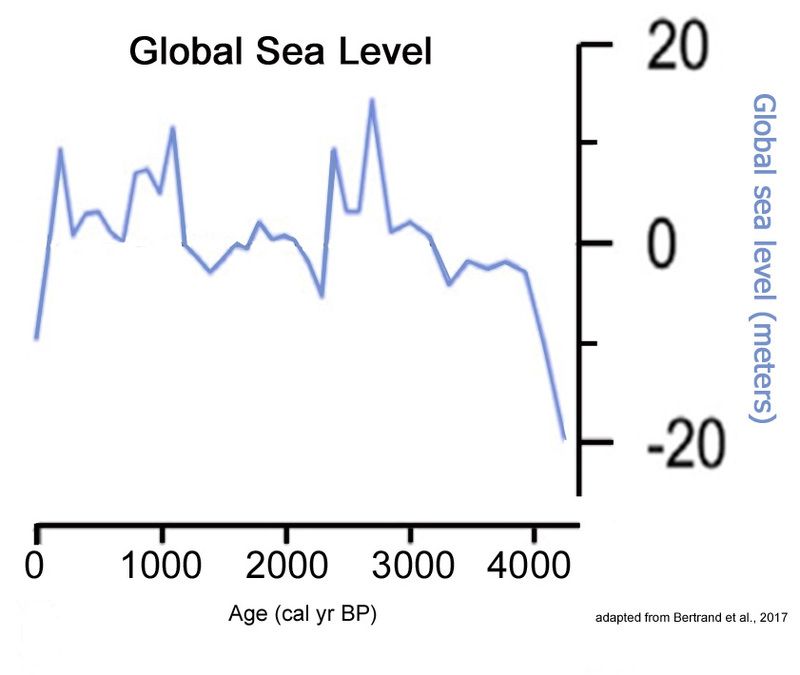 To top it off, estimates of global sea levels during the last 4,000 years indicate that modern variability has been modest, at best. Since 1900, sea levels have changed by less than 0.2 of a meter (IPCC, 2013). 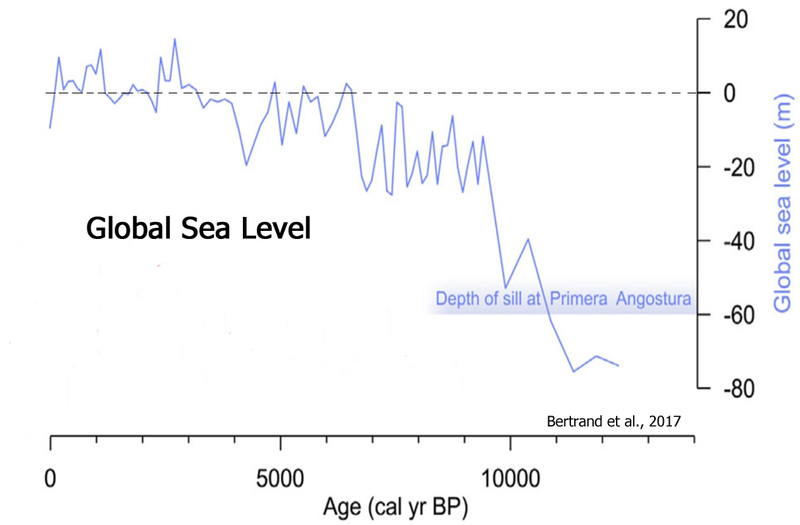 During the Holocene, sea levels rose and fell by meters over a span of centuries. 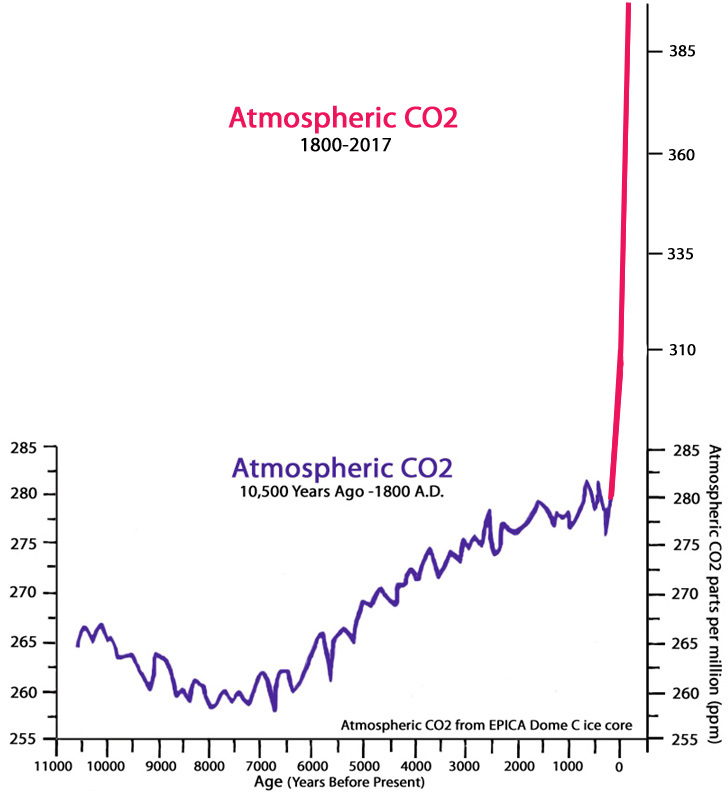 In other words, the much higher CO2 concentrations that exist today relative to the last 10,500 years have effectively had no impact on sea surface temperatures, glacier melt, or sea levels. During the last 4000 years, particularly low [sea surface temperature] values occur at 3500-3300 cal yr BP and during the most recent decades, and high values persisted between 2400 and 1600 cal yr BP. [I]t is likely that the abrupt increases in SST around 3300-3200 and 2400-2200 cal yr BP participated in triggering the meltwater events at 3250-2700 and 2000-1200 cal yr BP, respectively. … [O]ur sediment record clearly shows that CDI outlet glaciers melted rapidly at 3250-2700 and 2000-1200 cal yr BP, but re-advanced to calving locations relatively soon afterwards (Neoglacial III and IV). [T]he marked cooling of the last ~800 years may have very little to do with meltwater input and may rather represent the regional decrease in ocean temperatures during the last ~900 years (Caniupan et al., 2014). Another new paper published by Oliveira et al. 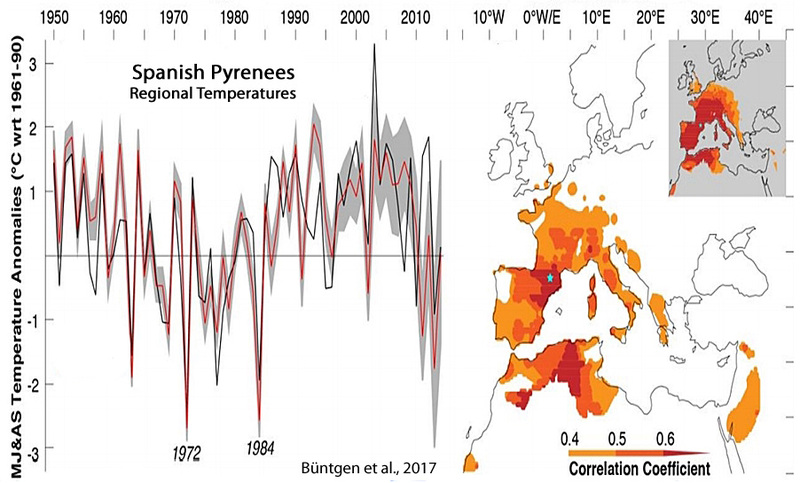 (2017) suggests that climate dynamics — precipitation, annual temperature, and forest cover changes — in the Mediterranean/Western Europe/North Atlantic region “have no apparent relationship to atmospheric CO2 concentration”. CO2 forcing is even characterized as “negligible” for this region. Instead, climate dynamics are primarily induced by changes in solar activity. [T]he millennial-scale vegetation changes in SW Iberia under warm interglacial climate conditions might be essentially generated by hydrological changes primarily induced by insolation [solar variability], as they are reproduced in the simulations despite the absence of ice sheet dynamics and all associated feedbacks in our experiments. The transient simulations under the combined effect of insolation and CO2 indicate that the interglacial vegetation and climate dynamics over SW Iberia have no apparent relationship to atmospheric CO2 concentration, as suggested by the pollen-based reconstructions. Although the direct impact of CO2 changes on the vegetation growth is not included in the model, a prominent example for this negligible CO2 forcing is given by its relatively high concentrations over the end of the interglacials, in particular for MIS 1 and MIS 11c, while the forest cover, annual temperature and annual precipitation achieved minimum values. We find that the vegetation and climate changes at this time scale are mainly driven by astronomical forcing, in particular [solar] precession, in agreement with the strong impact of precession on the climate of the Mediterranean region south of 40°N. 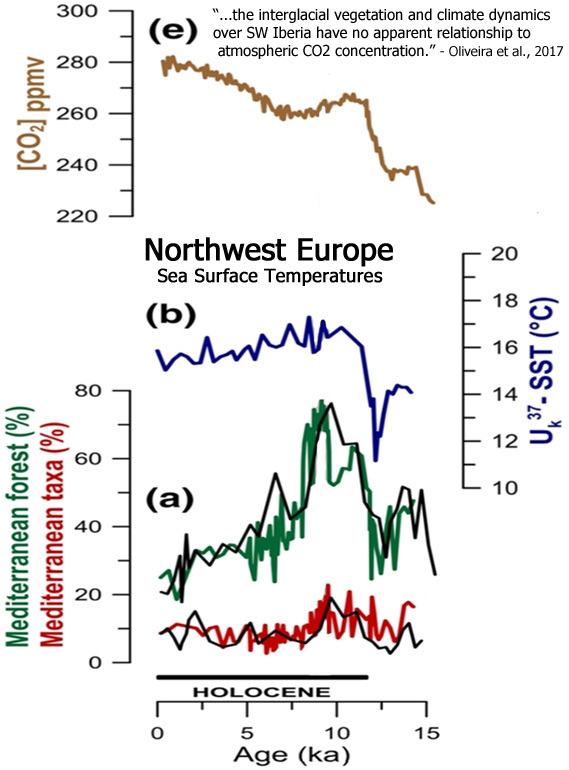 The negligible impact of CO2 concentration variability on the Mediterranean/Western Europe/North Atlantic climate has also been documented by other scientists for recent decades. 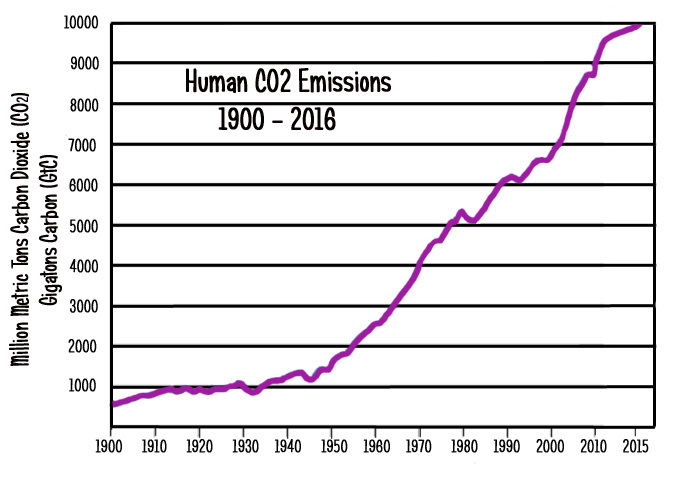 According to models, the dramatic rise in human CO2 emissions after the 1940s should have had an discernible effect on climate. And yet for this region, it has not. 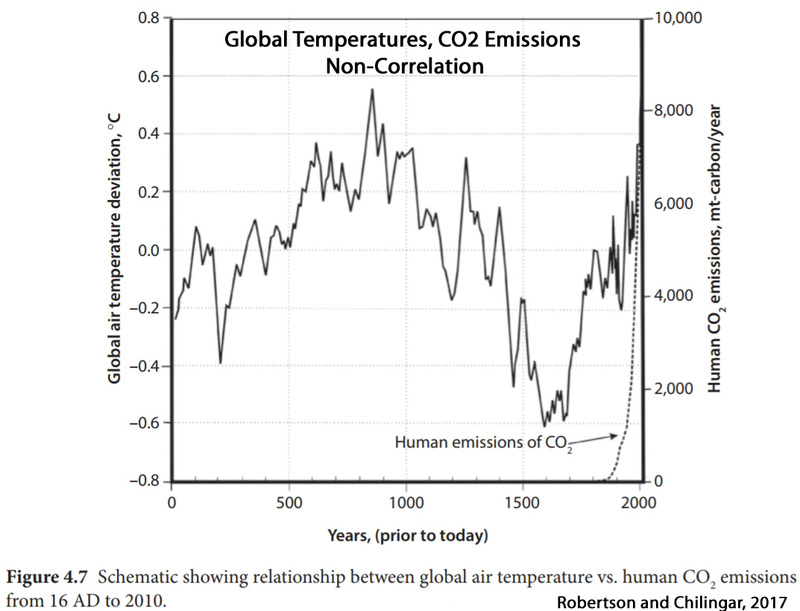 Temperatures are no warmer now than they were in the mid-20th century despite this ostensibly strong human influence. • The Spanish Pyrenees temperatures are colder today than they were in the 1950s. Little agreement is found with climate model simulations that consistently overestimate recent summer warming and underestimate pre-industrial temperature changes. … [W]hen it comes to disentangling natural variability from anthropogenically affected variability the vast majority of the instrumental record may be biased. 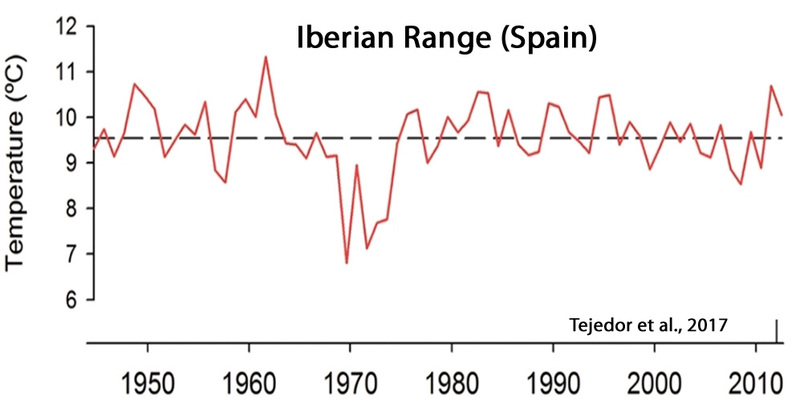 • The Iberian Range (Spain) is no warmer today than it was in the 1950s and 1960s…and much cooler than the 0-1300 A.D. period. 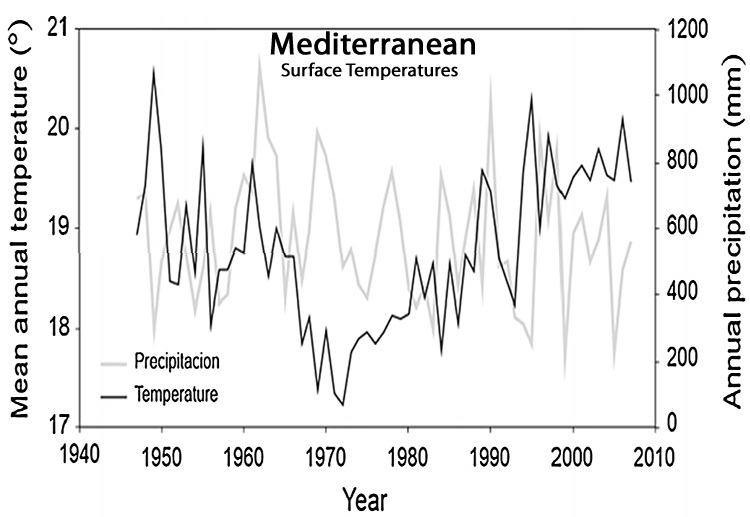 • The Mediterranean Sea is no warmer today than it was in the 1950s. 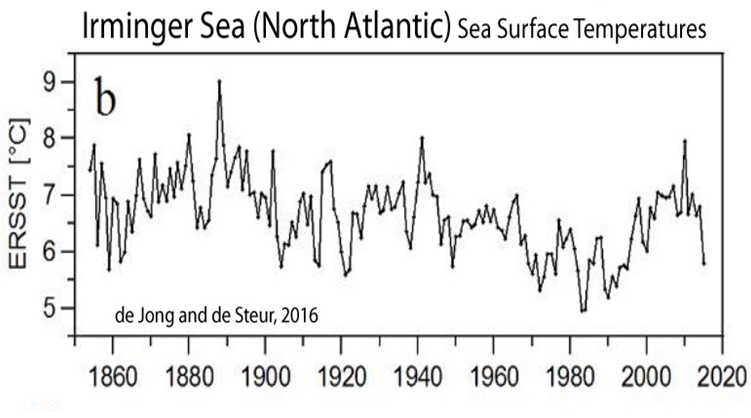 • The North Atlantic’s sea surface temperatures are cooler today than they were in the 1940s…and even the 1890s. 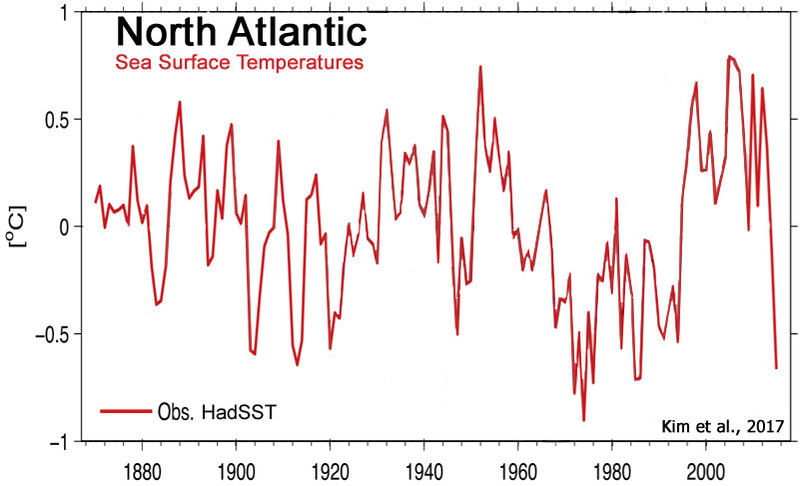 The Northeastern Atlantic’s ocean heat content was 0.5°C warmer than today during the 1500s to 1800s. 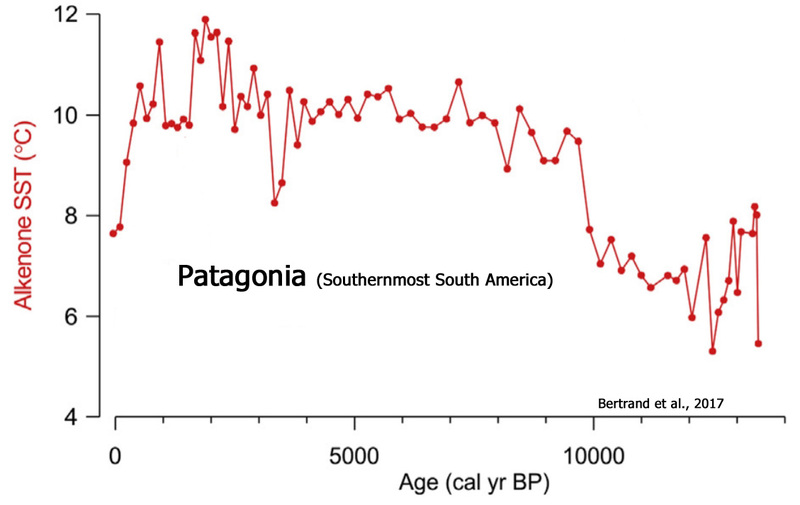 To summarize, the abrupt increase in atmospheric CO2 concentrations during the last few centuries has not had any discernible effect on climate parameters in southernmost South America or the Mediterranean/Western Europe/North Atlantic region. The explosive increase has also not appeared to influence climate changes in regions spanning from Antarctica to Arctic Canada to China either. Perhaps the most basic of anthropogenic global warming (AGW) precepts is due for reconsideration. • The entirety of the Antarctic continent has not warmed in the last century. 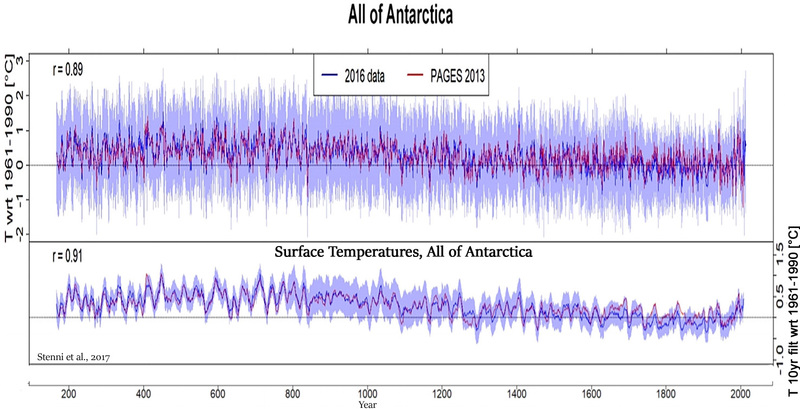 [N]o continent-scale warming of Antarctic temperature is evident in the last century. 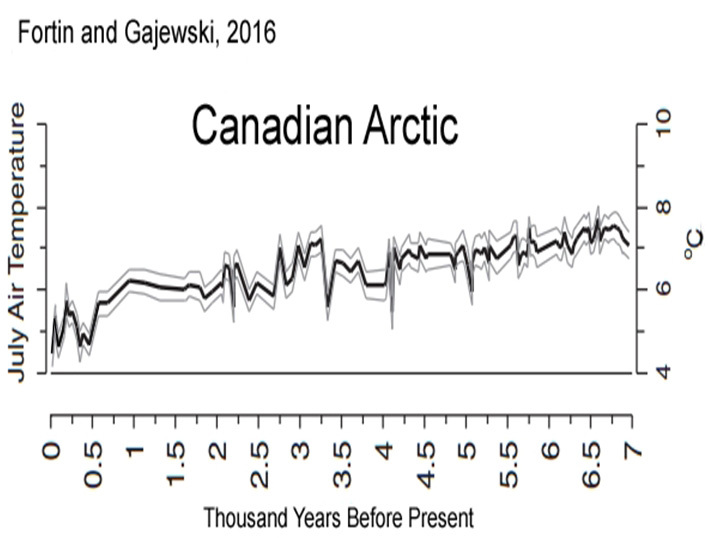 • The Canadian Arctic is 3°C colder today than the Mid-Holocene…with no warming in the last 150 years. Although biological production increased in the last 150 yr, the reconstructed temperatures do not indicate a warming during this time. … Modern inferred temperatures based on both pollen and chironomids are up to 3°C cooler than those inferred for the mid-Holocene. 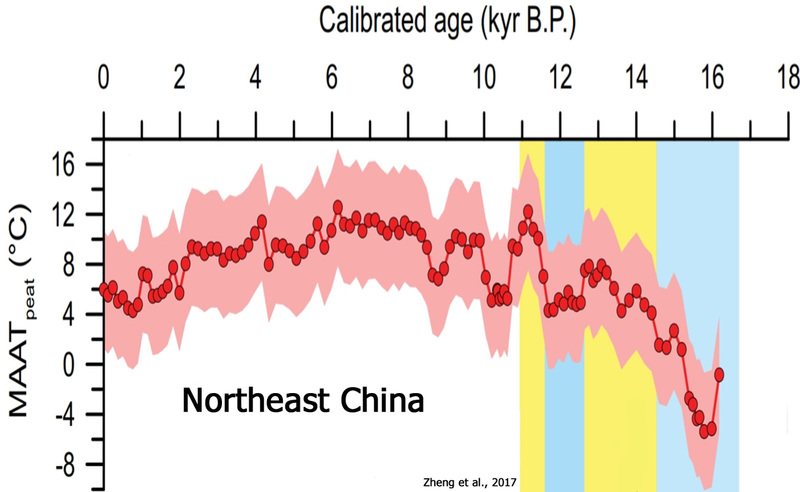 • Modern temperatures are about 5-6°C colder than they were 6,000 to 8,000 years ago in Northeast China. From 11.5 to 10.7 ka [11,500 to 10,700 years ago], corresponding to the Preboreal event, MAATpeat indicates even higher [temperature] values, from 7.0 to 12 °C. MAATpeat continued to vary during the Holocene. From 10.7 to 6.0 ka, temperatures rose stepwise, with 2 cool events at 10.6–10.2 and 8.6 ka, before reaching maximum values of ~11 °C during the early Holocene from 8.0 to 6.0 ka. Following the early Holocene, temperatures at Hani gradually decreased to values of ~5 °C, close to the observed temperature at Hani across the past 60 yr (4–7.5 °C). But, but the IPCC, UN, EU, the BBC and Sebastian say the world is warming disastrously. Cutting through all the noise: perhaps the most important and verifiable proxy for so-called “global warming” is the global mean sea level, as measured at coastal tide gauges. Of course there are problems related to the tidal fluctuations, to local/regional land settling, etc., but the existence of an acceleration signal (roughly corresponding to the rapid increase of human CO2 emissions since roughly 1950) would form a very important confirmation of the human-caused global warming hypothesis. Yet such a sustained acceleration signal is strangely missing. Looking at individual tide gauges, it is difficult to find a region of the globe where sustained acceleration even appears likely. This report from Gregory et al. (2013) is telling. Remarkable candor. Yes, this graph from that paper is rather telling. 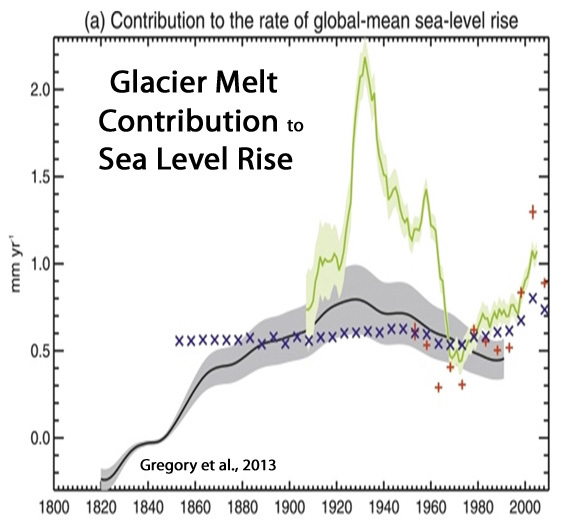 The glacier-melt contribution to sea level rise was significantly greater during the 1920 to 1950 period, when CO2 emissions were flat and low relative to the post-1940s period. In other words, no anthropogenic signal. You cannot make the assumption that sea level increases are linked to CO2 increases. Correlation, which needs mathematical analysis, not just a casual observation, cannot mean causation. Do you really believe that the climate oscillations seen during the ice ages were caused by changes in CO2. 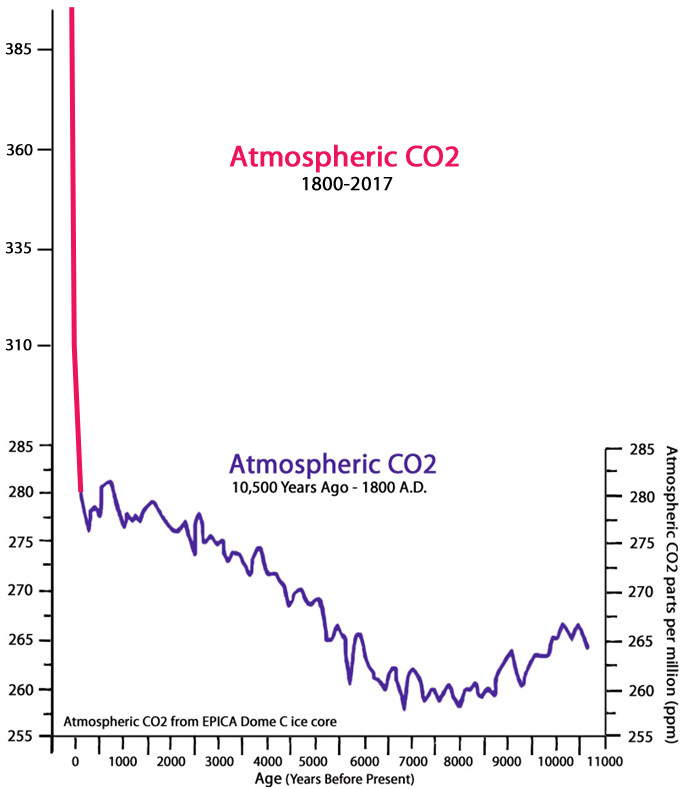 If so what happened to cause CO2 to vary? It certainly wasn’t humans.